WINDSOR, ON – Walkerville Brewery has announced details of a new beer that is being released for the 2018 holiday season. Black Forest Porter is a smooth, dark beer infused with whole Ontario tart cherries and shaved coconut toasted here at the brewery. This seasonal porter has a delicate roasted malt flavour augmented with a tart finish from 100 pounds of cherries, which is complimented by a light coconut aroma from addition during a long, cool maturation. The exquisite result is a richly flavourful, easy drinking porter ideal for the holiday season! 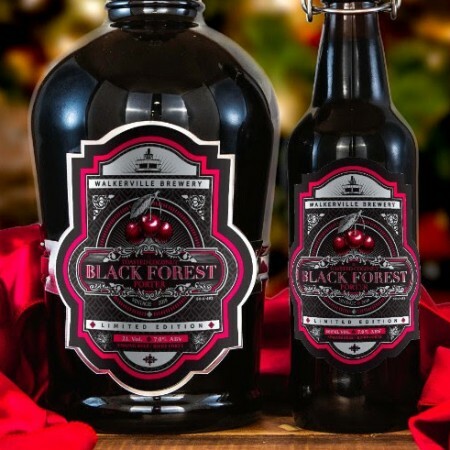 Black Forest Porter will be released as part of a Holiday Extravaganza event taking place at the brewery on Friday November 30th and Saturday December 1st. In addition to the debut of the new beer in 500 ml bottles, limited edition 2 litre growlers, and on tap, the weekend will also feature food and gift vendors, live entertainment, carollers, a visit from Santa, and more.